The Gathr film series giveaways continue this week, with the last film of the year! 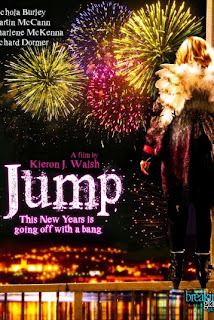 Jump will be playing on Tuesday, December 31st, at 7:30pm at the Maple Theater (Bloomfield Hills, MI) - it would make a great night out before or after your New Year's Eve celebration. This New Year is going off with a bang! Jump follows the lives of four twenty-something's whose lives collide one fateful New Year's Eve in a night of fast talk, wild coincidence and intrigue. The unseen yet crucial occurrence of this tale is the strange disappearance of Eddie Kelly, which hangs over the city like a dark cloud. A wayward corpse and the busy intrigue of New Year's Eve all compose the jigsaw puzzle of this out of sequence, multi-stranded story. And as the night's events expertly fall into place, Jump weaves an existential portrait of our characters' lives as their hopes, fears and secrets are revealed. Enter via the Rafflecopter form below. The ticket giveaway will end this Sunday, December 29th at 11:59pm EST, and winners will be notified the morning of December 30th. Winners must respond within 24 hours or other winner(s) will be chosen. Tickets are in PDF form and will be emailed to winners, who may print two tickets each (one for you + one for a guest).